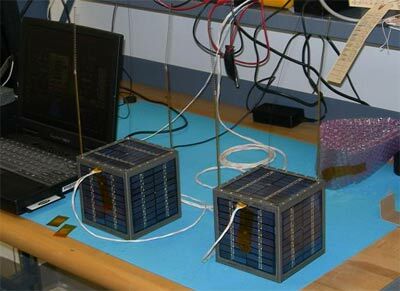 The US Naval Academy Satellite Labs RAFT Mission is to provide a cubesat in the cubesat cluster which has an on-board transponder capable of identifying itself via the NSSS satellite Radar Tracking system to help locate the Cubesats. Without this transponder, the Cubesats are too small to be detected by normal non-queued tracking systems, and so there is no easy way to find these individual cubesats once they have begun to spread from the original launch tracking elements. Secondly, RAFT will have a separate 217 MHz NSSS radar transmitter and receiver, which can help with calibration tests of the separate NSSS transmit and receive antenna beams. The requirement for two cubesats to mark the initial front and back of the spreading constellation, also gives two opportunities for experimental communications payloads. One is called RAFT1 and the other is called MARScom. RAFT1 is one of two small Cubesats being launched as a constellation from a PLA-2 Launcher from the Space Shuttle. This page addresses only the portion of the mission design that is unique to this Cubesat. For all other Mission and programatic information please go to the RAFT web page. Similarly, the design of the second sister cubesat is called MARScom. The MARSCOM satellite is one of two Naval Academy small cubesats in a two-satellite constellation which was launched on STS-116 on 10.12.2006 as part of the RAFT project. MARScom was conceived from a number of cubesat ideas following the 4" Stanford Cubesat design concepts and a previous DOD cubesat launch called MEPSI, and MEMS. But this mission expands the size to a 5" cube for nearly twice the mass and volume and a 50% increase in power. A 1200 baud packet TNC to RX on 10 m and TX on 148 MHz. The secondary mission of RAFT and MARScom are to provide packet digital communications relay for mobile units to transmit their GPS coordinates and messages via the satellites. This is a continuation of the PCSat 1, PCSAT 2 and ARISS missions.